Last week as I walked down Broadway in Soho, one of New York City’s most bustling streets, I politely rushed by two people handing out free newspapers. I’m not into free periodicals because they tend to have more advertisements than news, but this paper hand a diligent street team. 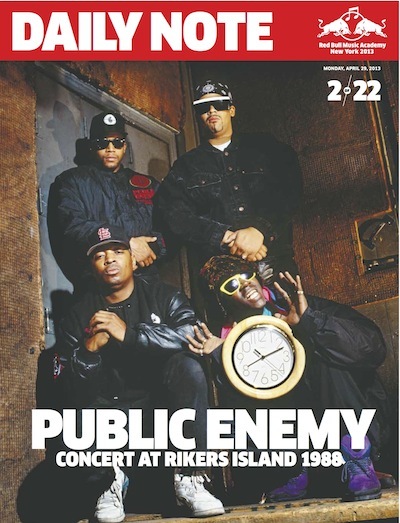 After I passed the third extended hand, I noticed there was a photograph of Public Enemy announcing a concert on Rikers Island in 1988. Although I remember the bass filled voice of Chuck D, I wasn’t old enough to enjoy any of his concerts let alone attend one on Rikers Island. I was enthralled by the image because it not only presented a focus on the injustice of a well maintained prison society, but it exposed the absence of active protest in music that could break the prison culture up at the time. Top Left Professor Griff, Top Right Terminator X, Bottom Left Chuck D, and Bottom Right Flavor Flav. I immediately researched the concert and realized it was a newsy event for the time. However, the media didn’t cover the show because they were encouraged by Public Enemy. P.E. wasn’t heavily favored in mainstream media because of their raw, conscious, and coarse pokes at the trappings of American society. Nevertheless, over one hundred members of the press crowded into Rikers Island’s gymnasium separated from the inmates only by barricades. Rolling Stones writer Michael Azerrad said, “Depending on your point of view, Riker’s Island Correctional Facility, in New York City, is either the first place or the last place you’d expect the controversial rap group Public Enemy to appear.” The didn’t understand Public Enemy, but they knew there was something sensational about the gathering. As an adult I realize the significance of this concert was not the lurid elements of a live show, a gesture of kindness, assembled for convicted criminals, but for its mission to uplift those forgotten about on Rikers Island and in other correctional facilities across the country. The performance gave the press a seat next to groups of men that were normally viewed through statistical analysis and grim newspaper footage. Public Enemy was the first rap group to preform live on Rikers, and that show still holds relevance today considering the prison system has effectively graduated from simply being a solution to societal problems through incarceration to profiting exorbitantly from an growing imprisoned population. Homeboy Sandman refocuses the discussion concerning Hip Hop the prison pipeline. Recently, this topic was heavily examined in an article by Stones Throw Records’ artist Homeboy Sandman. Sandman’s announcement addressed disturbing and inhumane issues concerning mass media and the prison institutions of America. Not only are these corporate relationship funneling their resources into building a “profitable” prison system, there appears to be elaborate plans to maintain this seemingly endless stream of revenue. These corporate giants appear to be placing money over ethics as Sandman says, “Prison industry lobbyists developing and encouraging criminal justice policies to advance financial interests has been well-documented.” The ever-connecting hands around America’s prison system is hidden in the titles. Sandman shares that simply because a company’s name doesn’t follow its partner’s on the letterhead doesn’t mean they aren’t affiliated, you have to investigate the company’s investments. Would people ever question their music, media, entertainment if it weren’t for articles like Sandman’s, who coolly reminds us of what Public Enemy raised in “Black Steel”? It may be insulting to suggest rappers aren’t aware of some of these obvious messages sent when “rachetness” has become the phrase to characterize urban entertainment. Or is it more offensive to assume rappers acknowledge these derogatory depictions and choose to accept what’s presented? In “Jailhouse Roc: The Facts About Hip Hop and Prison For Profit” Homeboy Sandman explains what is already clearly presented, advertised, but clearly misunderstood when he quotes Yaslin Bey (formerly known as Mos Def) and says, “Hip Hop is just shorthand for black people.” There is far more to be gain from this rich culture of Hip Hop. Read “Jailhouse Roc: The Facts About Hip Hop and Prison,” to get an eloquent and extensive refinement of what Public Enemy jammed about for so many years.